Dog Socialization: Practice makes... Perfect? Not Necessarily! "Practice makes perfect" is one of the most common cliches in the English language. It's one of those statements that is only kind of true. After all, if you're practicing a technique incorrectly, and doing it a lot, all that means is that you're going to be really good at doing something wrong. When I was a wrestler in high school, every practice started by drilling basic techniques like a double leg take-down. We learned quickly on a match day that if we had drilled sloppily, our double leg take-downs weren't going to magically work in a live situation. I see this happen in dog training all the time. People get it in their head that they are going to socialize their dogs. So, they take him to the dog park and hope the magic happens. 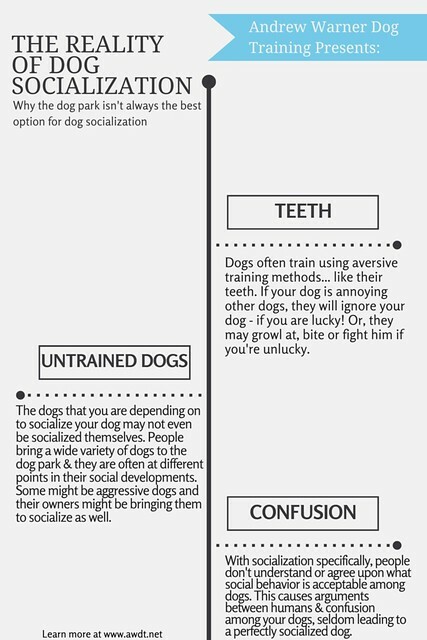 Sometimes this can help, but if you're depending on the other dogs to train and socialize your dog, you have a lot of things you might want to consider first! Dog training is a field where it is critical that you are using your training techniques effectively. If you are trying something as simple as a leash correction and you do it wrong 90% of the times, then that is hardly fair to your dog and will certainly work against your desired goal. It's summer time and a great time to train. If your dog has an issue you're working on, or you just want your walks to be pleasant, get training now! Your dog will thank you and appreciate it. Remember, practice doesn't make perfect - perfect practice makes perfect. How have you successfully socialized your dogs?